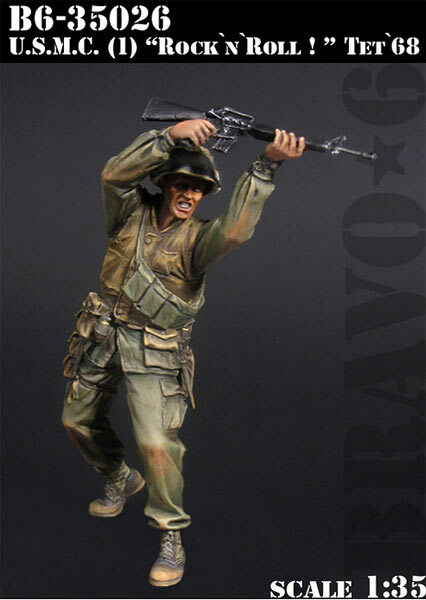 BRAVO-6 added a new figure to Vietnam War US Marines. 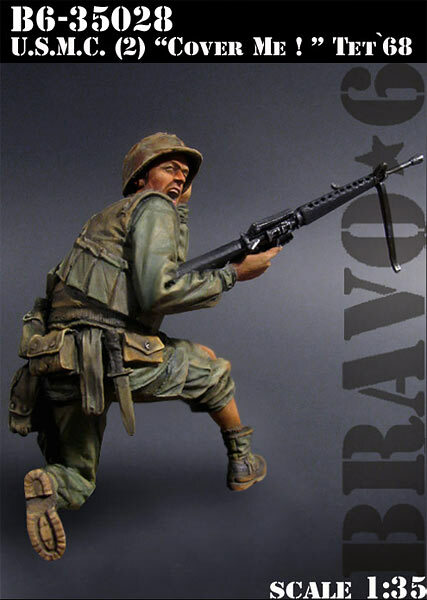 B6-35091 is a single figure kit including a USMC Rifleman on a kneeling to fire pose in Tet ’68. Figure comes in standard cardboard box labeled with a photo of painted figure. Body parts and other parts are safely secured in seperate small plastic zip-lock bags. Sculpted by Vladimir Demchenko, it comes in 9 medium grey resin parts. Resin quality is good, details are clean and crisp. Parts can be easily removed from blocks and no visible casting problems. There was a small flash resin under the chin and a few seamlines to sand on review sample. Body with head : The figure depicts an Afro-American soldier on his right knee. Facial details like high forehead, long chin, high cheek bones, large lips, curly hair and moustache are well represented. He wears typical Vietnam War US tropical jungle uniform of jacket with two breast and two waist pockets - all with flap covers, trousers with two rear and two cargo pockets on both sides and canvas-leather combined boots with trotters inserted into the boots. Over his uniform, he has a M1955 Flak Vest Pattern I for protection against small arms fire, shrapnel, and flying debris. It weighed about 10 pounds and was made of a mixture of nylon and a special protective material known as Doron created by bonding together glass filaments under high pressure, using methacrylate resin. This produced a hard but light weight material which could withstand ballistic impact at very short range. The vest was fitted with twenty three separate Doron plates, with layers of nylon to cushion the impact of a direct hit. The jacket had a zip front closure, an integral cartridge belt holder for attaching equipment and a rifle guard over the right shoulder. Wrinkles and folds on the uniform and details of the vest are well defined. He carries a canvas M16 bandolier on his chest crossed on his right shoulder. He has an pistol belt on his waist, two M-16 ammo pouches on both sides and a canvas first aid kit pouch on backside are attached to his utility belt . Arms are posed to fire/aim the rifle. Both show nice cloth folds and have small pins on shoulders to get the correct pose of the arms. He carries a 5.56 mm M16A1 rifle. Details of the weapon are well defined and hands are cast on the rifle - right hand on pistol grip with finger on trigger, left hand on handguard. M-1956 one quart canteen - 2 pieces to assemble on both sides of first aid kit pouch. M7 bayonet in M8A1 scabbard to be added to right back. M1 Helmet with Mitchell pattern camo canvas cover and helmet strap. LSA oil and C-ration matches are attached to helmet band. Another nice addition to Tet’68 figures with Vladi’s great good sculpt and clean cast. It can be used with all BRAVO-6 Marines and can really make a good fit when used next to 35026, 35028, and 35031 kits. Highs: Nice sculpt and cast. Easy to assembly with less parts. Verdict: Nice figure to use with other Tet 68' figures. 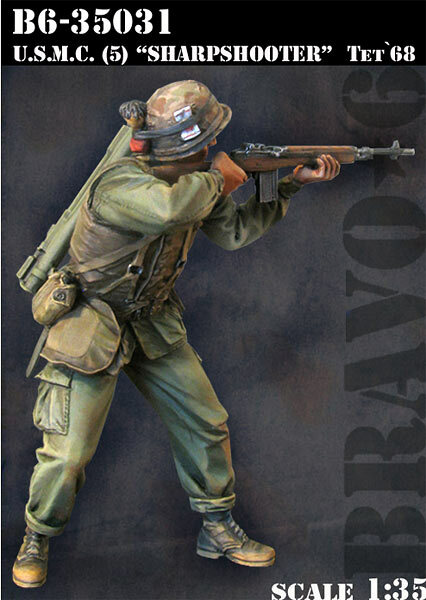 Glad to see Bravo-6 get more attention here on Armorama. Good review, Engin! YUP!!! I NEED this guy, too!! !